The tax treatment of carried interest has been in the news lately, following remarks by presidential candidate Donald Trump calling for higher tax rates on hedge fund managers. Trump’s remarks have sparked a renewed debate about the proper treatment of carried interest income in the U.S. tax code. Yet, many common arguments about carried interest have been blown out of proportion. Carried interest represents a relatively small portion of income in the United States and is ultimately a minor issue in the scheme of U.S. tax policy. The debate about carried interest concerns the compensation of investment managers – individuals who enter a partnership with investors, to manage their investment funds, in exchange for a cut of the profits. Generally, investment managers are paid according to some variation of a “two and twenty” formula, where they receive a fee of two percent of all assets invested, as well as twenty percent of all the profits they earn. This twenty percent fee is known as “carried interest,” and is used to reward high-performing investment managers for the returns they bring in. Simply put, arguments about carried interest are usually about definitions: should carried interest income be classified as labor income or investment income? On one hand, some argue that carried interest is a way of compensating investment managers for a service they provide, and is thus no different than any other form of labor income. Others claim that carried interest is a way of paying investment managers for their “sweat equity,” and is akin to investment income that they have earned. Of course, the classification of carried interest is not simply an obscure theoretical issue, because the U.S. tax system treats labor income and investment income differently. To avoid the double taxation of investments, the federal tax code levies lower rates on capital gains and dividends income. Currently, carried interest is often treated as capital gain income, leading to lower tax rates for investment managers. 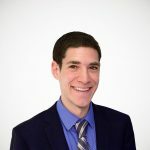 The treatment of carried interest has been a topic of public debate since 2007, when Victor Fleischer, a law professor, published a journal article on the topic. Fleischer’s piece, which called the treatment of carried interest “an untenable position as a matter of tax policy,” began a heated debate in Congress and tax policy circles on the topic. In 2014, Ways and Means Committee Chairman Dave Camp introduced a tax reform bill that would have raised rates on carried interest to 35 percent. Since then, at least four presidential candidates have called for carried interest to be taxed at ordinary rates. Debates about carried interest tend to take on a slightly hyperbolic character. Opponents of the lower rate on carried interest have called it an “egregious loophole” and “morally indefensible.” On the other hand, one hedge fund manager notoriously compared a proposal to raise the rate on carried interest to an act of war. But these statements seem out of sync with the relative unimportance of carried interest in the U.S. economy and tax system. As early as the fall of 2007, we’ve noted that carried interest represents only a small portion of all employee compensation in the United States. And treating carried interest as ordinary income would raise only a small amount of revenue. According to the most recent figures from the Joint Committee on Taxation treating carried interest as ordinary income would raise only $1.32 billion in 2016 and $15.64 billion over ten years. The graph above puts the treatment of carried interest in the context of other well-known provisions of the tax code. 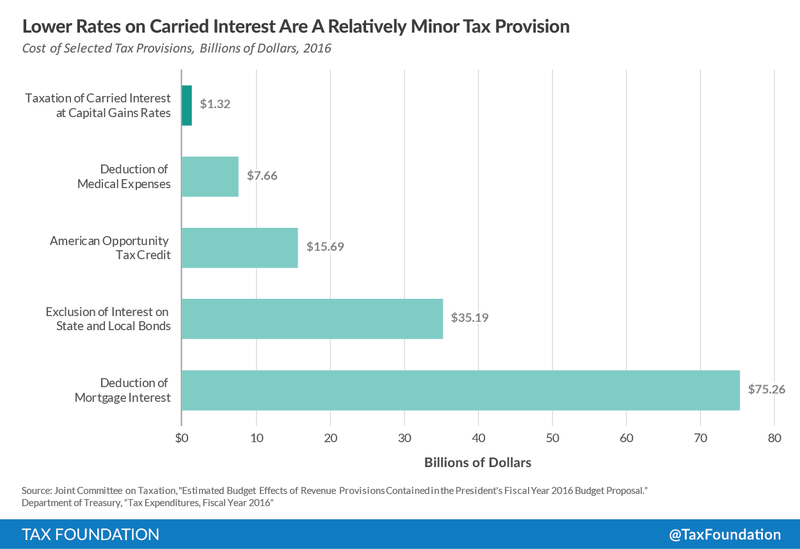 Treating carried interest as ordinary income would raise only a fraction of the revenue of ending the exclusion of interest on state and local bonds or the mortgage interest deduction. These figures confirm that, when it comes to federal revenues, the treatment of carried interest is essentially pocket change. As the 2016 campaign continues, it is likely that candidates will continue to employ heated rhetoric regarding the tax treatment of carried interest. But, with so many central elements of the federal tax code in need of reform, it would be a shame if candidates and the media spent too much time focusing on a relatively insignificant issue.